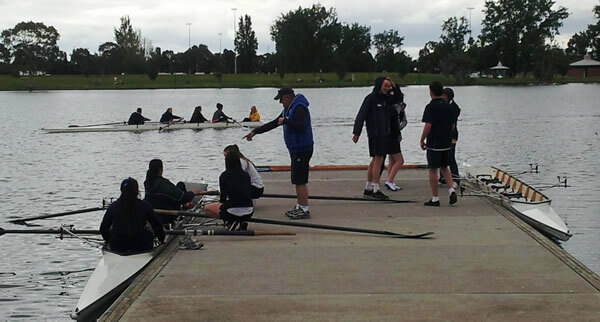 The Y Rowing Centre, located in Melbourne's beautiful Albert Park Lake, offers various programs for beginners, intermediate and experienced rowers. People of all ages can learn to row here, in a safe and friendly environment. Prices are very affordable. Crew rowing is an impact-free sport that gives you a complete exercise package. You don't need to be strong or fit to learn rowing. It's fun, and the smooth rhythmic motion of rowing gives your arms, back, legs, abdomen and buttocks a gentle work out, providing aerobic and strength conditioning. It can even help with weight loss. To try your hand at rowing, just turn up and have fun! Held on the first Sunday of each month, these sessions are open to both male and female participants of all ages. You will receive basic tuition in crews of 4 in an olympic-style shell (boat). You don't need to bring your own crew as there are always eager beginners, like yourself, ready to make up a crew.. and you won't get wet unless it rains. Unlike canoes, rowing shells don't roll over, so you can learn to row all year round. Cost: $15. Bookings only required for groups of 6 or more. Bring a thick pair of socks, t-shirt, bike shorts or track pants and a warm top during the winter.